I always like sitting on the run down to Pouhon. The banking is large and steep so you get a great view, plus they have giant screens in front to view. The speed they carry in to Pouhon is astonishing to watch and in the distance you can make the cars out as they head up to Blanchimont. It's a great spot. I'm lucky enough to be going to Spa this year - my first "overseas" Grand Prix (I live in the UK and have been to Silverstone a few times). Quick question - I can't see any mention of post race "entertainment" at the track? I know that Silverstone has a stage set up on the infield, and I was always very jealous of a friend who went to Abu Dhabi recently and the Saturday evening entertainment at the track was Muse!! Is there nothing similar at Spa, particularly on the Saturday night? Does everyone just go back to their campsites, some of which may have their own entertainment? We're camping in the yellow campsite near La Source. Don't know about the after race entertainment for sure, but there was always a good set of bars and a stage on the outside of Eau Rouge. If not, get a bus in to Spa itself. It's not that far and has a nice selection of drinking holes. As does Malmedy, it's just a smaller than Spa. I really like Malmedy though. Heading to Monza this weekend with General Admission. I hear Parabolica is the best corner to go in order to make it onto the circuit after the race. Anyone got any tips on making the most out of the weekend? Looking at going to Australia next year. At first glance "Jones" stand looks pretty good. Brabham looks good to me. The catch fencing seems to obscure the view quite a lot from Jones, no matter how high you go in that stand the fence is in the way of the apex of turn 1 (the best bit). Although Jones would be great if the cars were coming straight at you and you got the start but I don't think that is possible.. This is Brabham, less fence and a nice view of apex at turn 1, where the ovetaking occues. You can also see a screen from here which is crucial. My daughter just gave me Bronze tickets for Spa this year as a birthday present- Friday to Sunday. I'm stoked! And any suggestions on where to stay? I'm going to Silverstone for the first time this weekend for the MotoGP. I bought a general admission ticket so I have a good few options. Where would be good for the bikes? Does there be much action at Stowe or Copse? Or am I better off watching them navigate Maggots/Becketts? Also what's Milton Keynes like for partying? Previously been to Valencia in 2012, the year Alonso won - so the atmosphere was brilliant. Plus it doubled as a holiday in Alicante. I now have general admission tickets for Barcelona next year, but now looking for some advise on the best place to watch from (there seems to be quite a sizeable area allowed with General Admission). I loathe these invasive new FIA-mandated fences. Drives me batty and even made me move sections at the hairpin in Canada where GS21, entrance to hairpin, was put up about 6' taller than GS24 (exit of hairpin). 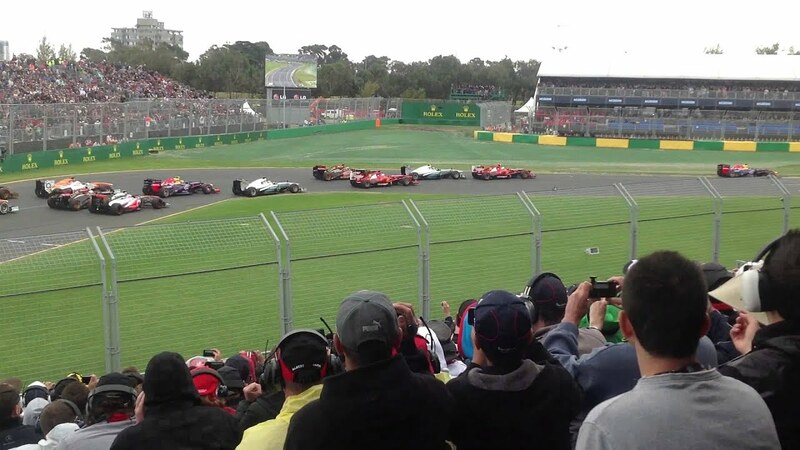 Here's the view in 2012 I had in GS21 SEC 10 front row (A) - I had numbered the sections on the opposing side so my seat buddy and I could determine which section we wanted to move to, we've been in GS24 SEC 4 ROW AA starting with the 2013 race...seats 1 and 2 which is where I circled so he'd know exactly where we'd be. I just bought tickets for the Hungary GP. Does it always say this? On my invoice it says, its for hungary. Do i need to call them, or is this normal? Maybe someone else who has attended Hungary can chime in, but I wouldn't be waiting to call to verify the wording. I'd always buy direct from the circuit. FOM add a little slice for themselves when you go to them. I'm going to Hockenheim too, but bought from the circuit. Went to Barcelona, Silverstone and Monza last year, and will be Silverstone, Hockenheim and Monza this season. Hi folks, looking for some advice about attending a Grand Prix, booked tickets for the Austrian Grand Prix as part of our honeymoon, we were thinking of staying in Vienna that weekend and travelling to/from the track on the Sunday (not bothered with any other days). Just wondering if anyone else has done this/something similar? Any advice on how to travel to the track? Train? Coach/bus? There are 6 of us staying at Camping Spa D’or this year. The site has a shuttle bus arranged for race day but nothing for Friday and Saturday. I’m going to get some prices for those days but if there is anyone else staying there that would like to join us let me know. So my Hungary tickets got sent yesterday. But thet got stuck in customs. Now this gets me a bit worried cos I had a package go trough French customs with Dhl last summer and it was stuck for 8 weeks. And then returned to sender. Now I really hope this is not the case. Is this normal for tickets? Any one ever got the same? How long does this normally take? Cos if it’s like the 8 weeks that I had last summer then I will be doomed! Post subject: First GP for 25yrs...where's best place now? Hi all...taking the wife to her first GP, and my first since the Mansell days! We've got a 3 day pass with General Admission pass for the race. Any pointers where to head on race day for good views with hopefully a giant screen to look at too? Probably going to buy seats in Gold 3 at Eau-rouge. I had previously thought that Sunday-only tickets included transportation from many cities across Belgium but don't see that option now. If we're staying in Liege, how to get to the track without a car on Saturday/Sunday?